Mort Kunstler Handsigned and Numbered Limited Edition Giclee on Canvas:"Courage in Blue"
About the Art: It was an unforgettable display of valor amid the worst of war. During the Battle of Fredericksburg on December 13, 1862, Northern troops from the Army of the Potomac under General Ambrose E. Burnside repeatedly assaulted impregnable Southern positions on Marye's Heights. Battle-seasoned troops from General Robert E. Lee's Army of Northern Virginia were defending a heavily-fortified line behind a stone wall. Wave after wave of Federal troops charged up the hill - and were slaughtered. Casualties were horrific. Watching so many brave men in blue hurl themselves into what was almost certain death, General Lee was moved to comment: "It is well that war is so terrible, lest we grow too fond of it." Near dusk, after numerous unsuccessful attempts to break the Confederate line, another assault was ordered. Among the front-line troops chosen for the attack was the 20th Maine Infantry, whose officers included Lieutenant Colonel Joshua Lawrence Chamberlain. A former college professor from Maine, Chamberlain would become one of the Civil War's most famous figures for his heroic defense of Little Round Top at Gettysburg - which may have saved the battle and the war for the North. He would later rise in rank to general and would be chosen to receive the surrender of Lee's troops at Appomattox. At Fredericksburg, however, what Chamberlain and the 20th Maine experienced was not victory - but sacrifice and defeat. The men from Maine pushed their way over the bodies of their fallen comrades to within a stone's throw from the Southern line before they were forced to find cover on the littered slopes of Marye's Heights. There they stayed in the bitter cold all night and all day, lying amid the bodies of the dead. Finally, on the afternoon of the next day, they were recalled for the retreat of the Federal army. It was a harrowing and heart-rending exposure to the worst of war for Chamberlain and his men. Yet, they had proven their mettle. The valor they and other troops from the Army of the Potomac displayed at Fredericksburg would become one of the war's most memorable and heroic sagas. 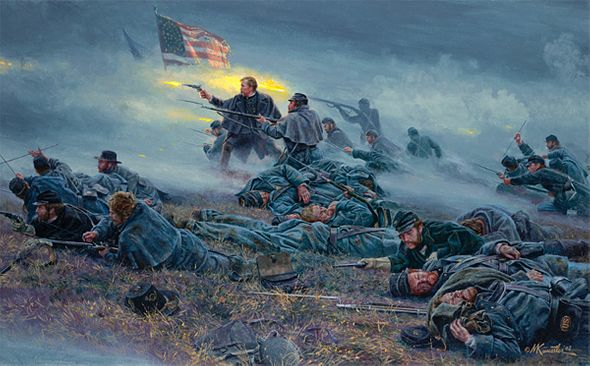 The measure of their courage would be recorded after the war by one of their former foes, General James Longstreet, who watched their valiant assaults from atop Marye's Heights. "A series of braver, more desperate charges than those hurled against our troops�was never known," Longstreet observed. Victory and acclaim awaited Chamberlain and his 20th Maine at Gettysburg - forged on the field of fire at Fredericksburg. The Civil War had so many heroes, and to me none is more appealing or inspiring than General Joshua Lawrence Chamberlain. Most students of the war are aware of his heroic defense of Little Round Top at Gettysburg, but much less known is the courageous charge he led at the Battle of Fredericksburg. It was such a horrible, bloody battle. Northern troops made numerous charges up Marye's Heights - and all of them failed. Finally, a new assault was ordered - and it included Chamberlain and his 20th Maine. Chamberlain, who was then a lieutenant colonel, heroically led his troops up the hill and into the horrendous fire coming from the Southern lines. Just yards from the Confederate line, the Northern troops were forced to take cover on the ground among the bodies of the dead. Chamberlain and the survivors of the 20th Maine stayed there under fire all night and all the next day before being relieved. In this painting, I have tried to capture the climax of the charge by the 20th Maine up Marye's Heights. The composition of the picture leans slightly to the left to suggest the forward movement of the assault. I've used the bright muzzle flashes of the regiment's rifles to make Chamberlain and the U.S. flag the focal point of the painting. Next year, I plan to do a companion painting to this work that will portray the Southern troops defending Marye's Heights at the point of Chamberlain's charge. Placed together, the two paintings will offer a panoramic view which will be almost cylcoramic in scope. To me, Chamberlain and the 20th Maine symbolize the courage and sacrifice that were typical of American soldiers in the Civil War on both sides - and I hope I have been able to convey that emotion in this painting.